In FunnelFlux there are many situations where you can click on something to load an automatic report. For example landers, offers, traffic sources, offer sources. This offers a quick way to start building a report segmented to just that item. The default setting here determines whether the flat or tree reporting mode is loaded when you click these, so set based on your preference. If someone loads http://yourdomain.com directly, or whatever root directory you use for FunnelFlux, it will usually show a white page with "404". This setting lets you set this to an actual page, i.e. your 404 page -- useful if you use FunnelFlux for a specific brand or product and want to send people to that by default. You could use any URL you want, even a FunnelFlux URL. Now, note when people click through on your landers as well -- if there is ever a time these return a 404, e.g. the user has cookies disabled and the action link has no organic parameter... i.e. FunnelFlux has no clue who this person is or what funnel they are meant to be in, it will return this 404 page as well. When you create offers and landers you get to choose multiple redirect modes, as described here. This option lets you set the default mode selected. When you turn on the Winners display in your stats, FunnelFlux will show statistical significance percentages based on your selected statistic, and will compare apples-to-apples i.e. things within the same "level" of your tree or grouping. The threshold here is the % above which FunnelFlux will highlight the bar green, indicating a variant being an overall winner. This value is up to you and how much you want the statistical confidence to be for determining your optimisation decisions. If you are using ClickBank you can review our tracking article here. 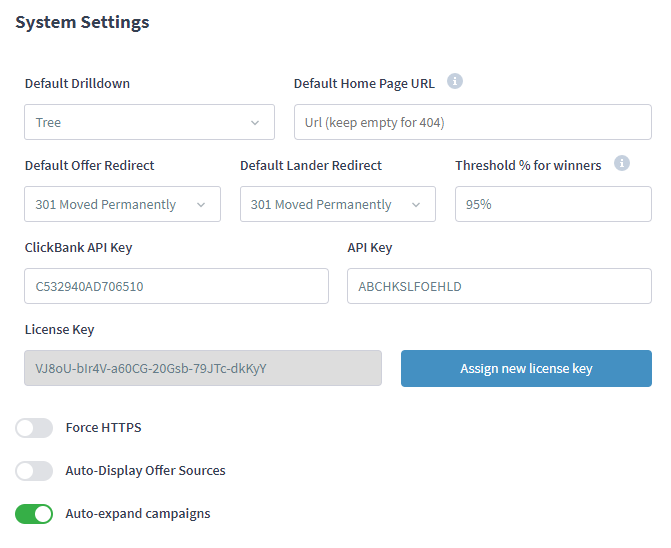 This is the area where you can put your ClickBank API key. This is your API key for using our data/stats API. The API key will save when you click outside the box or finish writing for a few seconds. Here you can change your license key to another in cases where you have multiple FunnelFlux keys and want to reassing in a specific way. This will force the FunnelFlux dashboard to load via HTTPS and all links will generate in HTTPS as well. This option will automatically append the source of an offer to its name in the funnel editor, to help you distinguish things. This will set your campaigns page to automatically expand to show funnels, rather than being collapsed. If you have a bajillion campaigns and funnels, you may want to turn this off.